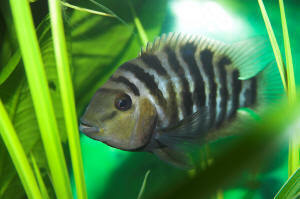 A nice Convict Cichlid pic sent in by Dave McNaught. I have a question about a tropical fish tank. I have always thought that putting anything, good or bad, in a tank would be absorbed by the fish in the tank. If the fish are sick, then putting medication in the tank would be absorbed either through the skin, or water going through the gills. Same thing with putting vitamins in a tank. Would they not be absorbed by the fish through the skin and/or gills? I've sort of had an argument with someone on this issue. This other person continues to say that freshwater fish do not "drink" water. but I've been told that unless it goes into their digestive system, nothing will be effective. I was hoping you could explain to me how a medication works if it's not given through the food, if it does at all? because if I put copper into the water, it's going to kill my fish by being absorbed through the skin. I mostly keep puffer fish, so that's mainly what I'm concerned with. I just fail to understand why something would not work unless it's taken through the digestive system. This issue came up because I wanted to dose my tanks with aquatic vitamins. I already soak my bloodworm in vitamins, but not all of my puffers eat bloodworm. So I was thinking if I dosed the tank, the vitamins would be absorbed by the puffers through their skin and/or as passing through the gills. Thank you for your time to answer my question. PS - Let Neale Monks know that I still have my mudskippers and that they are doing fine. Thank you to you and Bob for your responses. I really appreciate your time and expertise. This is where I am at; everyone is still alive (Honey Gourami, 2 albino Corys). I actually threw away the BioWheel to the filter about a month before emailing you last. I didn't know the wheel could contribute to nitrate production though. What happened was, I replaced the HOB for a short while with a Fluval U2 internal filter. I really liked the design but the current was too strong for the 10 gal tank. One time when the Gourami came up for food, I saw her slowly careen to the other side of the tank. Knowing that a high current could also be stressful, I decided to remove and return this filter and put the HOB back on, without the wheel since it was in the garbage at that point. I do not use the cartridges made for the filter. I put Fluval plain sponges in the box, and I also have AquaClear BioMax sitting on the bottom of the box (I don't know how efficient this set-up really is though. Before I used polyfiber and BioMax inside a media bag and I think that may have been better). I have increased filtration since your email. I installed a Hydro Sponge Pro II. It's been in for 5 days and I installed it without an airstone. I wonder, should I still have an airstone installed separately for the Corys? Also, will I be able to remove the HOB entirely and just rely on the sponge filter? I've noticed that the water seems clearer; not that it was cloudy before, but there seems to be more clarity now. I've also considered removing the HOB and installing a second, maybe smaller, sponge filter, if you think that's a good plan? I'm not looking to purchase an external canister filter, but I would purchase a new HOB to use with the sponge filter or a new internal filter if you think that would be better. I need to do more research about filtration because I don't know what chemical filtration is. I believe biological means the good bacteria, but I wonder, do sponge filters provide for chemical filtration? Now on to water changes. Since I live in an apartment, I don't store water since I have limited space, but I will find a way to do this if you believe letting water sit is a better way to go. What I do now is this; I take temperate water from the tap, treat it with water conditioner, let in sit for 3-4 minutes, then add. Now that the nitrates have been under control, I am doing 25% weekly water changes. Do you think my procedures are okay? Also, I use Tetra AquaSafe Plus water conditioner, and I've recently been wondering if it's any good; any thoughts? It's hard to calculate the amount of conditioner to use for such small water volumes, and I realized that in the past I wasn't using enough, which I'm sure has confounded my problems, especially since there is a lot of chlorine in my city water. Now I believe I am using the correct amounts (I use 3 drops for every quart of water). Also, according to my lease, I can't have a tank larger than 10 gal, so that's that for now. As far as their health; the Gourami now sits under the sponge filter. She eats and is probably 50% active, 50% sitting. The 1 Cory, that only has a sliver of a fin left due to fin rot; he swims around, then stops for a bit and breathes hard. I thought maybe this was because of the extra effort it takes for him to swim, but of course I'm worried it could mean something tragic as well? I guess the fins can grow back, it'll just take a long time? I feel bad for him, but he is getting food, so that's good at least, and what's left of his fin has remained constant. It seems the other Cory guides him a bit; maybe its my imagination, but he seems to be helping him out a little. Oh, well he also has an eye problem; it's white on his eye. You can slightly see red from the actual eye. The white went away a little bit, but now what's left has remained constant. That eye looks smaller too but maybe I'm mistaken; it's hard to tell. I'm not sure what is going on with the eye but I don't believe he can see out of it. I just figured with continued improved water quality, that maybe it would get better, but I really don't know. The other Cory is doing well. I guess that's it for right now. Thanks again! Your insight and help has been tremendous support! I was just re-reading my last email to you from April, and in that I stated the albino Cory had a front fin and a sliver left of the other front fin. Which means the fin rot has progressed! That front fin is now gone! It only has the sliver left and that is it. What was left of the tail is gone too. I thought once the nitrates were under control, the fin rot would stop. Should I do anything? I have a 2.5 gal tank that I can move him too, but of course medicines would be too hard to treat in that. Maybe move him there and try salt? Or just leave him alone? As a side note, I believe the medications were the actual cause of the Peppered Corys dying. I can't say I've ever successfully medicated my fish. I was wondering too, in your last email you mentioned aquarium sterilizer. Is this an actual product you can purchase? Or did you mean something like peroxide? Well obviously the water is still not where it should be. Please advise. and my nitrates are much better - 10-20). Did a further 25% water change and redosed the MelaFix. Is this Columnaris? A fungus? Something else? 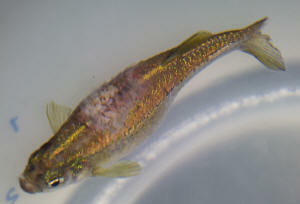 I include a photo of the Danio who died and the platy with the fuzzy eye. should they arise. Thanks again! My discus importer suggested the use of potassium permanganate to rid my discus of gill flukes and any other external parasites that might be going on with them, based on my description to him of their eating habits. He also explained the treatment in detail, it's duration, what behaviors to watch for, and how to neutralize when done. He has been using this treatment for years to condition his monthly incoming shipments, before he sends the livestock out to his customers. The discus are housed in a 240 gallon aquarium with a freshwater ray and 5 large clown loaches. Do you know if the ray or the loaches will handle the treatment? Or would it be better to set up a separate 55 gallon treatment tank, and treat 4 or 5 discus at a time? aquariums. Can you please advise if there is any alternatives or where you can recommend that these medications can be purchased from. <Hello Scott. Unfortunately no, in situations where those medications are required, then there's really no alternative. It's the same situation in the UK where antibiotics are, I think rightly, prescription-only drugs. The only I'm worried about now is that i live in the United States and I've never seen eSHa here. what would be a good backup or where can i get something like what you're talking about. 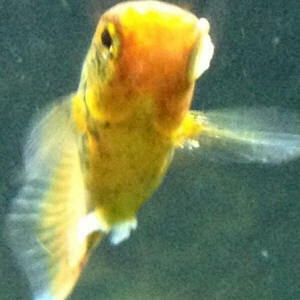 Re: swim bladder problems in golden Orfe Dear Bob Fenner, My extreme thanks for your suggestion of Epsom Salts in the water to cure the problem. This certainly seems, after only two days, to have worked. I have been recommending you to all my friends. <Ahh, good... magnesium sulfate is a good general cathartic for many fish ills. Bob Fenner> Gratefully yours, Ken Drewitt. Re: Meds and UV Sterilizers Thanks for the reply. As for Aquarisol: my bottle says copper zycosin, as does their website. Nothing about silver. <Yes... used to be silver based... now copper> The word copper makes me think you can't use it with the UV on. <Depends on chelation, sequestering... Easy enough to do an experiment... with and w/o the UV on and testing for free copper> I just want to confirm it is ok to do so before trying it. Whaddya think? If not, what about Clear Ick by Aquatronics, which is quinine monohydrochloride and gentian violet, whatever that is? <Another good choice... or as stated previously just raising the temperature will do it...> Just want to be sure my UV doesn't turn the meds into something that will kill everything in the tank. <Mmm, no, this won't happen. Bob Fenner> Thanks again!